Schools typically do not use cognitive skills training to help reading. And yet, until cognitive skills such as processing, sequencing and attention are mastered, reading progress will be limited regardless of how much extra instruction and tutoring is provided. The brain is plastic, meaning cognitive skills can be trained and improved. About 25% of kindergarten age children read naturally, because they develop strong cognitive skills naturally. They transition from listening to reading with ease. Our cognitive skills training helps struggling readers develop these essential skills so that they also can become natural readers. The vast majority of struggling readers have weak auditory processing skills. This cognitive skill delay may not be evident in spoken language where the requirement is only that words be understood as whole sounds. But reading requires another big step up in processing accuracy, being able to break words into component sounds. Stored spoken language (word memory) is how we learn, think and read — we match text to words in word memory to get meaning. These reading matches require the brain to be able to pull apart and store in word memory every sound in every word. It needs to hear that “cat” has three sounds “c-a-t” and to store it that way. If the word “sneaker” was heard as “s-n-ee-ga” that word can not be read fluently, without requiring some concentration. Reading also requires the ability to absorb and retain information while reading. This is the key to reading comprehension, and to critical thinking. If working memory is not developed properly, grade level reading comprehension will be a challenge starting in 4th or 5th grade. Sound reading comprehension requires focused attention. This is a learned cognitive skill, often under-developed when reading is a struggle. One of the least understood cognitive skills is sequencing. It is a high-level processing skill, required for decoding, spelling and extracting meaning from text. This tends to be a weakness in children with auditory processing delays, mainly because it is a cognitive skill not practiced. Gemm Learning provides cognitive skills training using the Fast ForWord program. Using adaptive algorithms Fast ForWord gradually builds processing speed up to 40 sounds a second as is required to hear natural language with 100% accuracy and which converts into efficient reading and comprehension. It then builds vocabulary, fluency and comprehension using age-appropriate sequenced exercises. 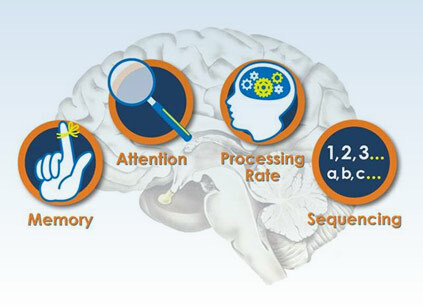 In some cases, particularly where there is evidence of cognitive impediments to reading not related to auditory processing — such as visual processing, attention issues related to sensory integration issues, longer term retention issues — Gemm Learning will add BrainWare Safari into a student’s cognitive skills training protocol.